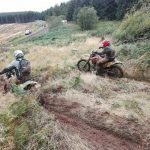 WHAT could be better than taking part in my first adrenaline-filled of the dirt bike events, a two-day rally weekend in the picturesque Brecon Beacons in sunny, warm August weather? 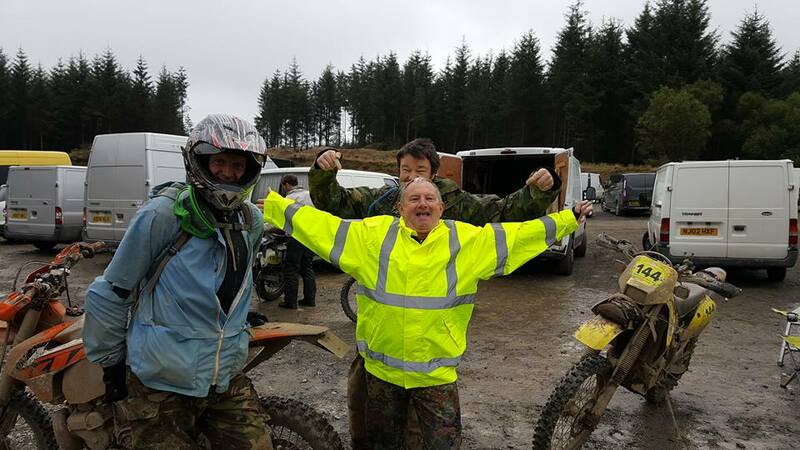 Riding at dirt bike events in a hurricane with gale force winds, sideways rain and 4ft deep puddles of course! Not to be cowed by the doom-mongering weather forecasts, Central Bristol TRF’s hardy adventurers set off for the wilds of the Brecon Beacons filled with trepidation and excitement. 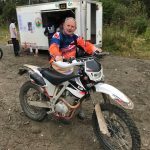 Being a complete newbie to off-road biking and rallying – I got my licence last year and joined the TRF a month later – I was a little bit nervous about what was ahead. My companions Ian ‘Turtle’ and Paul “WoopDeWoop” were hardened veterans, and I knew I could rely on them to get me prepared. Which was why I was a little surprised when the main priority on the long journey into the Welsh mountains was to stock up on Ambrosia rice pudding! John ‘trail legend’ feeling a bit worse for wear! 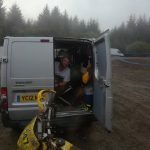 Our war-chariot was Ian’s grey Transit, loaded with bikes, pulling a grey horsebox which carried my DRZ in the back – making it the heaviest road vehicle since Big Daddy and the Giant Haystacks’ tour bus. The faces of the locals as we pulled into the Morrisons car park in Brecon said: “The pikeys are here, lock up your daughters and lawnmowers”. 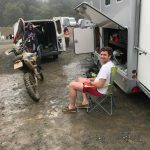 After a four-hour crawl through hill and dale, we finally arrived in Llandovery, the home of many dirt bike events where the more sensible TRF’ers were already ensconced in their comfy b&bs. 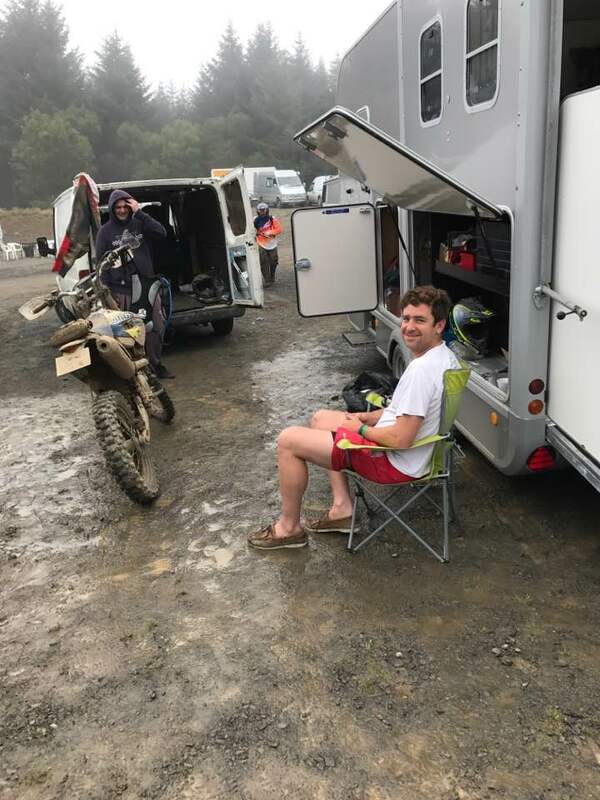 The camping – much to Paul’s annoyance – was not at the race start in the forest as in previous years, but in a site behind an industrial estate next to Llandovery Rugby Club’s pitches. As we arrived, the heavens opened. Ian’s giant MX gazebo went up to give us some cover and was immediately blown over and sent cartwheeling across the campsite. 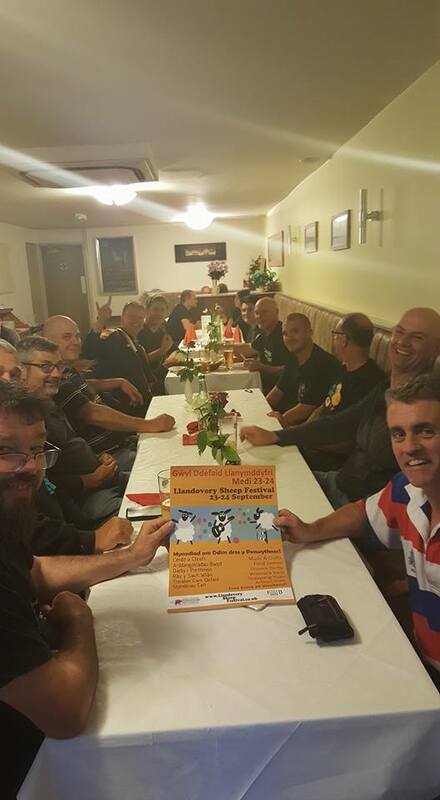 We ventured into town to join John ‘trail legend’, Weston Dave, Iain ‘the bat freak’ and co for an athlete’s supper of curry and beer. Paul was worried Indian was “a bit complicated” and vowed not to eat anything too spicy before promptly snaffling most of the lime pickle and choosing a fiery jalfrezi – a decision he was set to regret the next morning. The conversation soon turned to previous injuries and crashes, as tales of broken necks, months of concussion, and damaged limbs helped fuel my anxiety. After a restless night in the horse box with the dulcet snores of my companions aiding insomnia, we were up at o crack sparrow’s fart for a champion’s breakfast of bacon and spaghetti hoops. The start of the rally was deep in the Crychan forest and as we slugged up-up into the mist and clouds, I couldn’t help feeling like Bilbo Baggins heading for Mordor squeezed between my two half-wits (sorry Hobbit) mates. At the pits, we lined up to sign in, get our times to reach each section (which we wrote on white tape on our bike in marker pens), and pass through scrutineering. The marshal looked at me as if to say “Are you really going to do it on that piece of s***”. 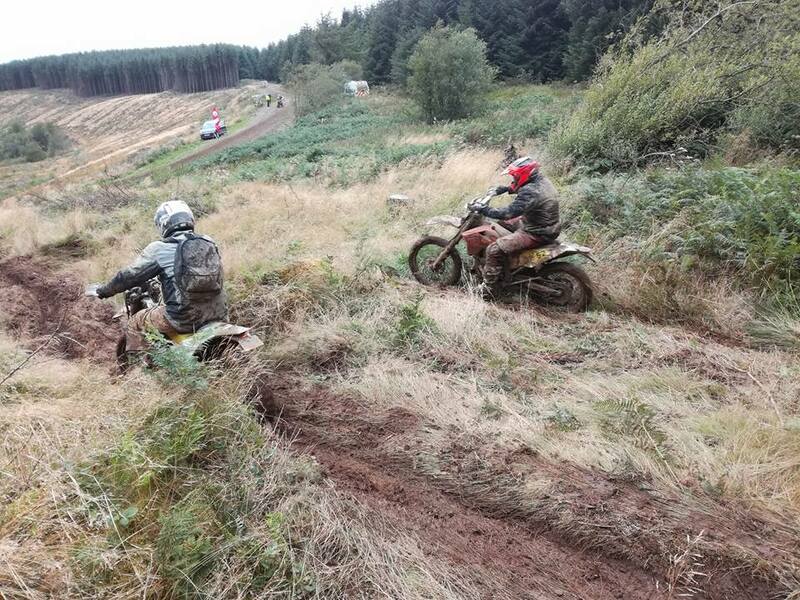 Earlier in the year, I had taken part in the excellent Somerset TRF training day in Exmoor Forest which required trials tyres – and in my ignorance had thought that “if it was ok for that, it was ok for this”. 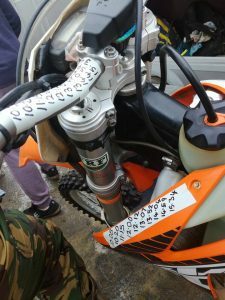 The ‘Deezer’, 2002 DRZ SK2 had also developed an electrical problem and was failing to charge its battery – leaving me worried it would run out at any time. While the experts frenziedly readied their machines, making last-minute adjustments, I sat in my camping chair, downed a shot of whiskey and sucked on a rollie. Feeling a little out of my depth my mood was buoyed by seeing some of the other bikes people were attempting the rally on. 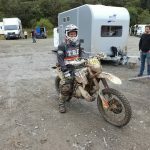 Among the countless KTM’s and Huskys, there was a sprinkle of other DRZ’s, including club mate Iain (aka: Batman), as well as a big BMW the size of a battleship, a Tenere, an Army issue Harley Davidson, some Husabergs, the odd Beta, and a GasGas or two. The start times were staggered with the pros, and clubmen including Ian and Paul who all set off in the top 30. I was further down the field with clubmates Top-gun Tom and Batman Iain starting just ahead. Tom and I nervously checked out the start of the course and started preparing our excuses. And we were off. A 35-mile course through very wet and soggy hills and forest. The format was three laps with two timed sections. The first lap was a sighting lap and didn’t count towards your score. The first section took you through a series of four very deep puddles where periscopes and Admiralty shipping buoys would have come in handy. Those trying to wimp-out by going around the edges paid for it by sinking into the very boggy ground. Then onto the first fire road where there was a chance to blow out any water as we raced to speeds up to 80mph – despite the road dropping off very steeply into pine trees below. 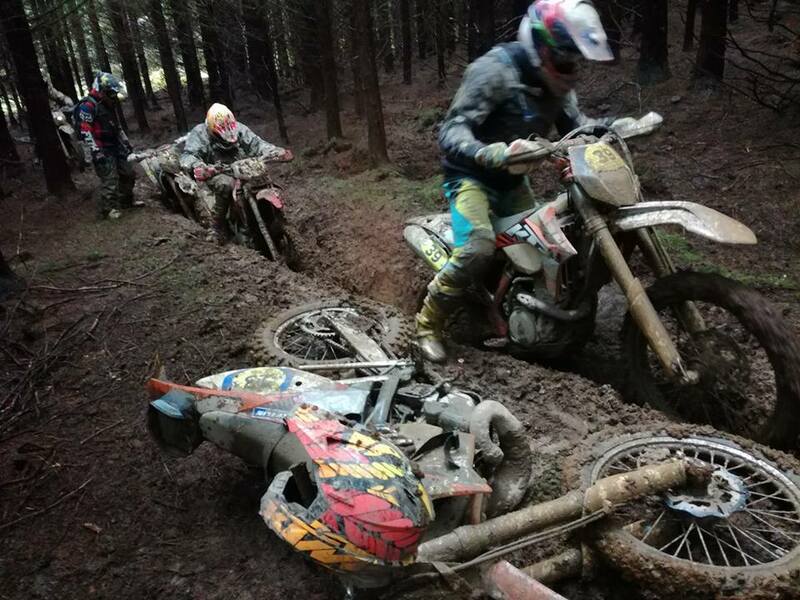 The first timed special section took the riders up into a very muddy corner of the map where a bog of despair had to be negotiated. I watched in awe as the guy on the big BMW “Bismarck” fishtailed around on his half road/knobbly tyres. 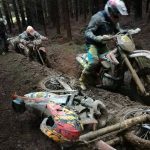 A pileup ensued as riders nose-dived into the mud. I witnessed one poor bloke with just a back wheel and his helmet sticking above ground. That part of the course was scrapped for the rest of the rally. The route then took a steep, narrow dog leg down to the bottom of the valley before hitting another fire road then into a long, very soft muddy, rutted section. All dignity was lost in this section with flailing legs either side of the bike desperately trying not to wash out the front tyre.By that point, I was only five miles into the course and already feeling the aches in my wrists, forearms and legs. After the initial exhaustion and excitement, it became possible to relax and slow down and enjoy the course. 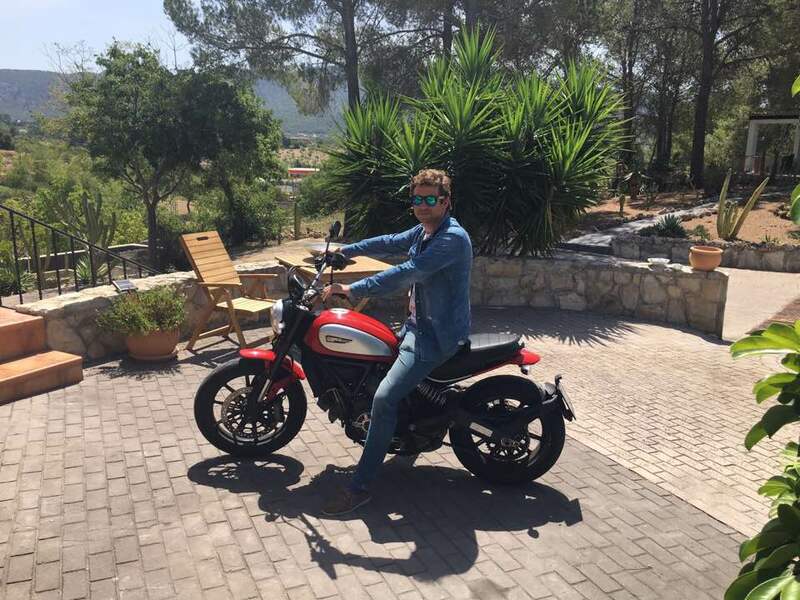 The fire roads gave time to rest and sit down on the bike – despite gunning it as fast as you dared. Another section involved a hill climb along a track deeply rutted by JCB diggers and strewn with branches of chopped down firs. As I conquered this section, I thought to myself how amazing these dirt bikes really are. They can pretty much go over anything. Pick your line, be confident, and let momentum and the dirt bike do the work. Often I also found myself sitting back, closing my eyes and praying too! The second timed section was shorter but involved what was later to become a scene from Paschendale. A steep climb into a dense wood with only one real discernible route led to a descent which became so deeply rutted all you could do was put your feet either side, bent up, so your knees touched your ears, and paddle down it like a land canoe. It was here that I learned later that Paul DeWoop had ground his chain against a root jamming it into his front sprocket and leaving him paralysed with a queue of angry riders behind. Luckily as I hit that part of the course, the marshals had begun sending people around the carnage. I popped back into the monorail, or scalextrix track, and slid down to pop out on the fire road below. But in my excitement of whizzing past the heap of better riders, I turned too sharply on the gravel and wiped out – just 10 yards from the finishing line. Phew! Back at the pits and I had only managed two laps but was exhausted. A shopping basket of golden Ambrosia rice pudding lay by the petrol and oil, and I tucked in and called it a day. Hats off to Ian, Top-gun Tom, John ‘trail legend’ who made it round for the with the three laps in the bag on both days (200 forest miles). 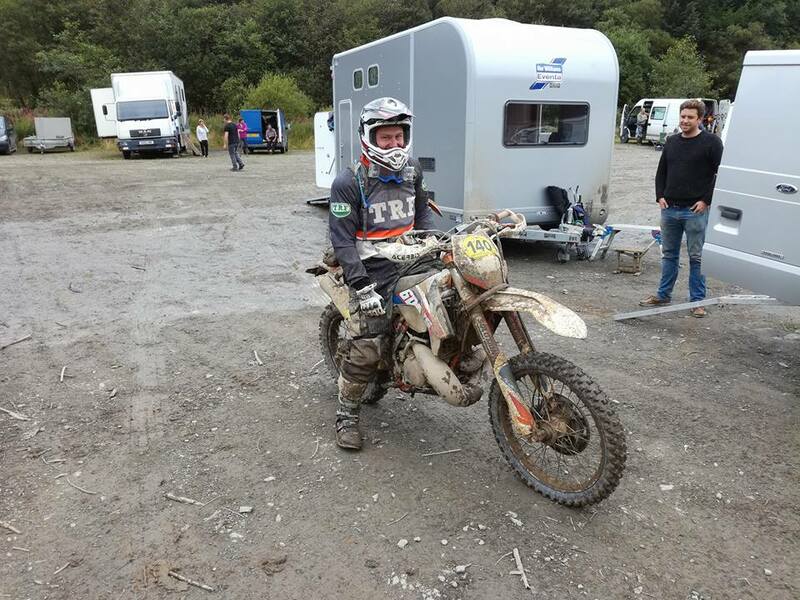 Mr DeWoop was last to arrive back on a seconded WR and his KTM delivered on a marshal’s trailer. 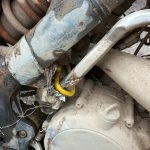 After some precision surgery of “whacking it like f***” he was able to unjam his chain and reattached his broken kickstart with some bungee cord, ready for day two. No such problems for Ian, whose Husky was given two new wheels, and looked like new. 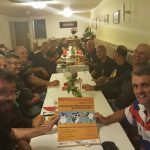 After a hard day’s riding, the assorted rallyers made their way to Llandovery rugby club for a buffet of curry (again), lasagne, and cold meats and salad. A slightly weird quiz was held, one of the questions being “name all the Kardashians”, which we amazingly came in third. 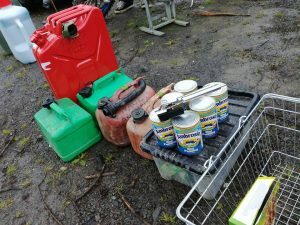 The winners took home a hamper of WD40. 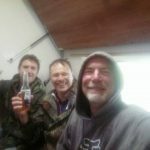 By this time we had been joined by ‘Too-tall’ Kev and a mate of Batman’s, Paul, who had driven up on his big 650 adventure bike, both racing just on Sunday. Those who had done the first day took delight in winding them up with tales of how murderous the course was. Day two and the track had become wetter, muddier and more treacherous. The four giant puddles had become 10, and the monorail section had been cut out and replaced with a tricky wooded bit. But I was not to see that far as the electrical problems which I feared would stop me racing at all, reared their ugly head. 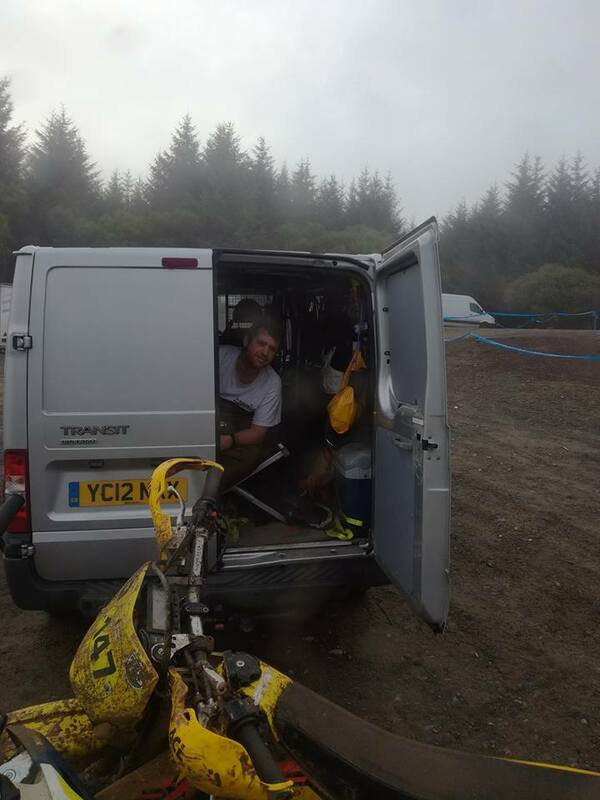 Going down the steep narrow hill on the first timed section I took a roll into the bushes and the bike conked out. The battery had finally given up the ghost and despite a jump start from Kev and Paul, I could only get it to the next marshal point before it would go no further – Game over! As I retired to the pits, I could only watch with respect as the others ground out a gruelling three laps. I had only managed some 80-odd miles of a possible 200 plus and was quietly gutted I hadn’t done more. 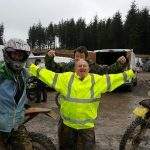 Still, on the other hand, I was quietly chuffed and happy to have emerged pretty much unscathed ready to battle another day on more dirt bike events with the TRF gang.